If you're a fan of scenic drives and are looking for a new destination, Kentucky's 12 covered bridges might be just what you're looking for. Each of these beautiful bridges was built in the 1800s, and they're still standing strong today. The bridges have become popular destinations for many travelers for a multitude of reasons. Although you won't be able to actually drive over most of the bridges, you can still enjoy them by walking across. 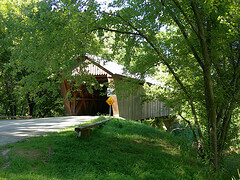 As most of the bridges are located near Lexington, it's very easy to make a day out of visiting them. The bridges are popular with photographers, so if you're interested in photography, you may really enjoy taking pictures of them. The bridges all have different things to admire about them. Goddard Bridge, which was built in the early 1800s, has beautiful lattice work. Ringo's Mill Covered Bridge was built for a grist mill in 1867 and is a great snapshot into what life in a mill town might have been like. 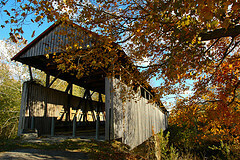 Walcott Covered Bridge has historical significance- it was crossed by Basil Duke's soldiers during the Civil War. Bennett's Mill Bridge is the only bridge of its kind left in America. Each of these bridges as well as the other eight has something truly unique to offer to visitors. Whether you'd like to enjoy the scenery of Kentucky or just admire the bridges themselves, Kentucky's 12 covered bridges are a must-see. They are a wonderful way to take a look back in time. It's lucky that so many of these bridges are still standing, and you should take the chance to see them while you can. Last updated by Marianne on 02 August, 2012 in Destinations.